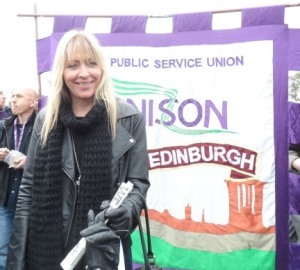 Statement on Edinburgh ‘Transformation’ by Amanda Kerr UNISON Branch Secretary. UNISON has major concerns about this report to council. With so little details can councillors honestly put hand on heart and say they they fully understand exactly what they are signing up to? Whilst we can see how the report lays out a mini council approach, it is extremely unclear what lies beneath? Where does almost 1000 jobs disappear from and how was this figure arrived at? Obviously the Transformation team, having looked at the “questionable” results of the activity analysis (which we have yet to see) have some idea of where these groups of staff will be deleted from , but can you guarantee that the same quality or level of service can still be provided? The way the Voluntary Severance package is being presented basically holds a loaded gun to the heads of your staff, jump now or we will push you eventually on far lower package! We have had problems in the past when we moved to the neighbourhood structure, confusion around roles and lack of specialist knowledge at managerial level, should we not have learned from this mistake? Councillors were elected to provide the best quality public service to the people of Edinburgh they are supposed to represent, they were not elected to decimate services and put people out of work. Council is aware of the effect of job losses can have on the local communities. Whilst recognising that councillors feel the pressures from Westminster and Holyrood we ask that this council become the Champions of public services and not the champions of cuts. We urge you to fight back against the cuts and stop sitting back qnd merely pass them on. We therefore ask you to oppose the motion or at least defer it until more details are given.